Use the X_TRADER® Aggregator Configuration dialog box to configure and control the behavior of the aggregated instrument as it trades. After you add legs to this window, configure the optimal aggregated instrument parameters based on your trading needs and click OK to save. To leave this window without saving your changes, click Cancel. Note: You can open, but not edit, an Aggregator Configuration dialog box if the aggregated instrument has working child orders. You can open the Configuration Dialog Box by selecting New... or Edit... when creating or modifying an aggregated instrument in the Aggregator Manager window. After adding legs to the aggregated instrument, configure the optimal parameters based on your needs and click OK to save them. To leave this window without saving your changes, click Cancel. Taking -- This mode is used when an Aggregator order is submitted to cross the market when there is liquidity immediately available for taking at submission time. The “Taking” parameters dictate the ratio of allocation across the legs. Joining -- This mode is used when an Aggregator order is submitted to join the market when there is no liquidity immediately available for taking at submission time. The “Joining” parameter dictates the ratio of allocation across the legs. Rebalance -- Use these parameters to configure Aggregator’s rebalancing function. Aggregator monitors all leg markets for liquidity available for immediate taking. If liquidity on the target price appears on one leg with no working orders, then Aggregator rebalances the resting order quantities into the available liquidity based on your configured percentage. That is, Aggregator moves the orders from the less favorable market to the most favorable market. Tick Information -- Displays calculated tick size based on the contract tick size. The contract selected for each leg of the aggregated instrument must have the same tick information. These parameters are populated automatically for each contract. Aggregator always routes the order to the exchange with the best price: A buy order is always routed to the exchange that ensures a fill at the lowest price, and a sell order is always be routed to the exchange that ensures a fill at the highest price. Until the submitted order quantity is matched, Aggregator continues looking for the best price equal to or better than the Limit price of the order. Best Rank Ratio: Orders are routed in parallel to each exchange with order quantities selected based on the rank in which legs are configured: the leg that is configured first is ranked first, the leg configured second is ranked second, etc. When aggregator splits an order based on this setting, the displayed quantity in the first exchange is filled before the second exchange is considered, and so on. 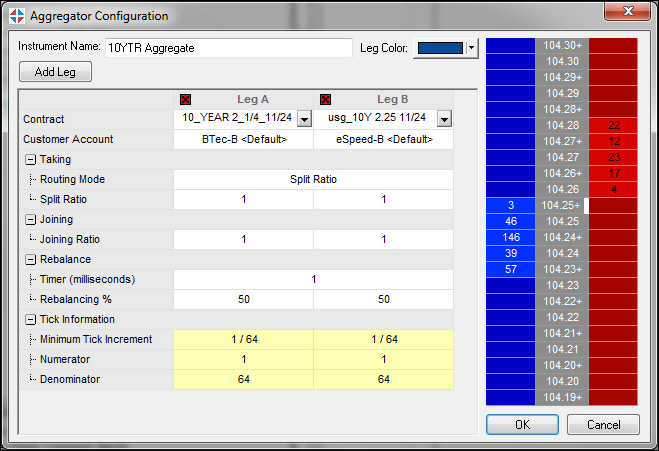 Split Ratio: In this mode, Aggregator routes the order quantities to exchanges based on a configured ratio. By default, the ratio is equal for each leg. Any leftover quantity after splitting is allocated to the leg with the highest ratio. If the ratio is the same in this case, then Aggregator routes the order based on which leg is configured first. Size Ratio: If this mode is selected, then the order quantity routed to each exchange is determined based on the ratio of the existing order quantity at the best price. In this mode, orders are routed to the exchange with the most orders at the best price, which increases the chances of getting filled. For an example of how Aggregator allocates order quantity to each leg in Taking mode, refer to Example: Taking Mode. When Aggregator joins the bid or offer passively, orders are routed to the exchanges based on the configured constant ratio. Any leftover quantity after splitting is allocated to the first leg. The default setting is an equal percentage for each order quantity. Sets the time to wait between successive rebalancing. Time is in milliseconds, with a default of 1 ms. Note: setting a wait time between successive rebalancing is strongly recommended. A "market turn" in one leg (resulting in immediate liquidity available for taking) could indicate an imminent market turn in other legs which would preempt the need for rebalancing. Rebalancing % For each leg, sets the percentage of working order quantity that is re-allocated during each rebalancing cycle. By default, this is set to 100 (%) for each leg. Displays the minimum tick size for contracts in the aggregated instrument legs. The value is defined by the exchange. Numerator (Uneditable field) Displays the top number of a fractional tick increment. Denominator (Uneditable field) Displays the bottom number of a fractional tick increment. After configuring the legs of the aggregated instrument, the aggregated prices display in the Aggregator Preview Ladder in the Configuration Dialog Box. The Aggregator Preview ladder shows the number of current bids and offers at each price level in the aggregated market, which allows you to preview what is displayed in MD Trader before launching the aggregated instrument. Because there are 960 contracts left to allocate (Target Qty 1000 - 40 allocated contracts), Aggregator continues to Phase 2. Because there are 910 contracts left to allocate, Aggregator continues to Phase 3. Because there are 330 contracts now left to allocate, Aggregator continues to Phase 4. Any odd number of leftover contracts are allocated to the first leg. Because there are 0 contracts now left to allocate, Aggregator continues to Phase 5.